Human brain plasticity doesn't seem to be shared by chimps - is this a unique gift? Human brain plasticity doesn’t seem to be shared by chimps – is this a unique gift? It seems like evolution has fostered us humansto become the dominant species on planet Earth. We owe so many gifts to the tender processes that began millions of years ago and shaped us the way we are today. Gripping dexterous hands, social behavior and let’s not forget about those brains. It’s not enough to have a big brain, though. What makes us humans particularly successful is our ability to adapt constantly to our environment. Humans fair well in luxurious plains, but they seem to survive in the desert as well. Then look at the times we’re living in. Technology, networking, all our cultural heritage. It takes a lot to adapt to changing times, and no other species seems to be this good at it. While we owe a great deal to genetics, it’s brain plasticity – an inherent ability to mold our cerebral connections to fit our environment – that took us the extra mile. Chimps, our closest relatives along with Bonobos (we share 99% of our DNA), do not seem to share the same ability. A group of researchers performed brain scans to examine the heritability of brain organization in chimpanzees compared to humans. They performed MRI scans on 218 human brains and 206 chimpanzee brains. The humans involved in the study were either twins (identical and fraternal) or siblings, while the chimps had a variety of kinship relationships, including mothers and offspring or half siblings. 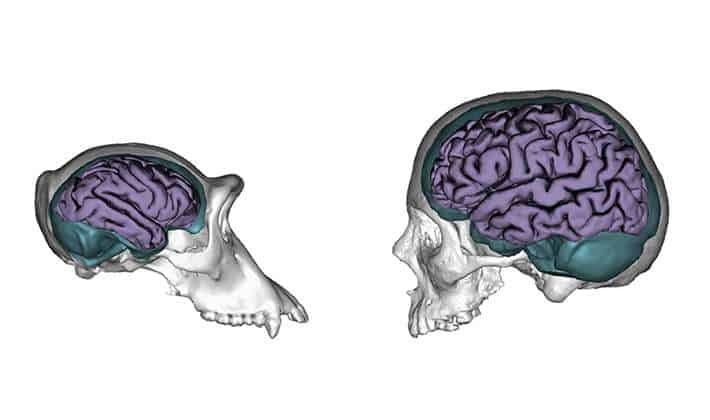 Brain size in both humans and chimps was obviously directed by genes. In contrast, however, chimpanzees’ brain organization is also highly heritable, but in humans this is not the case. In other words, while we take cues from the environment and restructure our brain patterns accordingly, chimps think in a certain way from birth. They may be incapable of adapting past what they’ve been used to for generations. “A major result of increased plasticity is that the development of neural circuits that underlie behavior is shaped by the environmental, social, and cultural context more intensively in humans than in other primate species,” concluded the researchers, who published the findings today in Proceedings of the National Academy of Sciences. While chimps do live in communities, these are far less complex than human’s. Does human culture stem from brain plasticity? It may very seem likely. Just look at how human culture has changed over the millennia. Constantly morphing, always different, just like our brains. There’s a great deal of things we share with primates, but there also some unique traits to us humans. Much more work is required and many puzzles await. “We still have a very incomplete understanding of what is special about the human brain compared with the brains of our closest fossil and living relatives,” researchers wrote in a new study.